You may remember a little while back we raised some concerns about a foster carer agency that were using the social media site Twitter and tweeting what could only be considered inappropriate sentiments in order to attract foster carers. Those sentiments were based around money and they were using huge cash incentives to try to get foster carers on board. More worryingly, the Twitter account was being handled by someone who refused to tell us if they worked for the agency and what their names were – a fatal mistake in the world of social media, where transparency is prized. And whilst their tweets were not aggressive, they were surly and opaque. Shortly after we raised our concerns with them in a series of public tweets online, we noticed that they started to change the way they were sending out messages on Twitter – they had back tracked from their position and despite denying any wrong-doing, had simply done a u-turn on their stance and were starting to adopt a slightly different strategy (pardon the pun). A few weeks later we noticed that their twitter account was frozen – not blocked as such, just undergoing what appeared to be a revamp. And sure enough, once they came back online, their tweets had completely changed in tone and content. 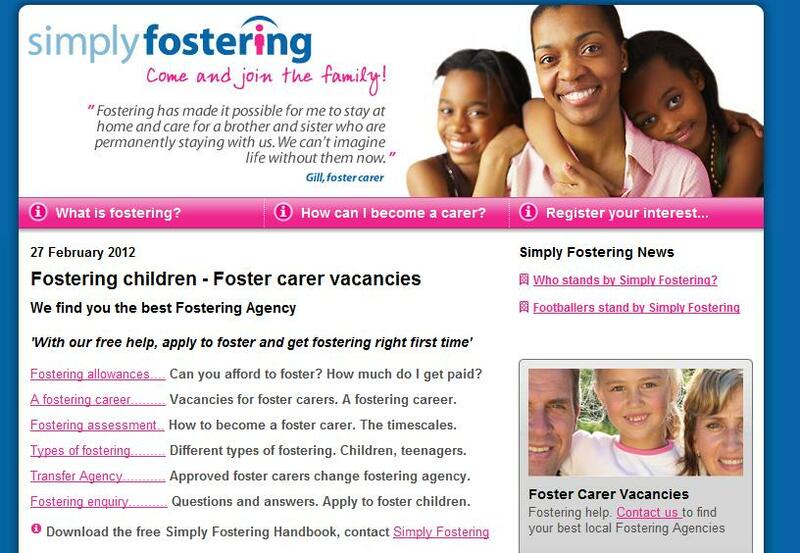 We also began to notice that their tweets were almost identical to Simply Fostering’s, another care agency. So we had to ask – and we did. As we hadn’t heard back from them and could see they were avoiding the question, we decided to find out for ourselves. And this is what we found. We discovered that the two agencies were in fact, affiliated; that Simply Fostering considered itself to be the UK’s ” most successful online independent foster carer recruitment company” and that Foster Care Agent were providing free advice and practical support for families who were thinking of transferring from their existing agency. There were several things that concerned us – the first was that this agency is independent. Sometimes, in the family sector, that can be a blessing, but in this case it raises issues of quality control. The second was that this agency appears to be turning over a lot of business (although we haven’t checked their annual reports), and having seen how they do that, it also raised alarm bells about the culture inside the system – using inappropriate incentives seems to be the norm. The third, was that they also appeared to be trying to ‘poach’ foster carers from other agencies by offering “free advice and practical support… to ensure that people interested in fostering have their questions answered“. And then we discovered Annette. This is who you can contact if you have any queries about being a foster carer. Annette, though, hides behind a contact form: click her name and all you get is this page. Annette has no job description, no picture and nothing to her name. Annette could be a robot; she could be the agency secretary or she could be the CEO. Given that the agency don’t even want to reveal who’s doing their tweeting for them, who Annette is, is anyone’s guess. Do you see what we see? Identical tweets, tweeted at almost the same time, and this sample is not the exception to the rule. We also see the rather obvious and tasteless attempt at gaining exposure by asking social media users to retweet, which just means pass on, their tweets if they are concerned about the state of children needing family support. They use an indirect and noble sentiment, to try to subliminally endorse their agency. Yuk. It is fair to say that many affiliated organisations on Twitter tweet identical tweets (oh my, say that really fast ten times), and whilst it is just downright boring to read, there is no harm in it. What is interesting here though, is that Foster Care Agent has had a social media makeover and we’re not sure that there is any sincerity behind the change. And they may even thank us, as they did last time, for giving them some exposure….. But we’ll let you decide. Have we been too harsh? Over to you…. I am unable to find their annual accounts on the site, as I always follow the money. We are not a Fostering Agency, our qualified social workers give advice and find you the best fostering agencies to choose from. That is really, really bad considering they are potentially accepting people to be foster carers who do not want their details to be made obvious to Social Services and are not confident in their foster caring abilities. This looks like they’ll foster children out to anyone who just wants the cash for doing so. That is extremley bad. It looks like they are not an actual Fostering Agency, just a middle man go between who like to hide your details from the Local Authorities and Social Services and they take a fee from you for joining up with them for them to find you an agency for you to foster children through and Foster Care Agent is just a linked site that wants you to change over to them so they can get a fee from the actual foster care agencies for getting you onto their books as a foster carer. All of it looks really, really bad. Yes, I don’t like the set-up either. It’s looks like it’s nothing more than a skimming exercise. This is the way the “money chain” performs… 1:-Family allowance for the first child approx £20/week 2:- Foster carers via a private agency receive an average of £400/week. 3:-The private agencies that recruit fosterers receive from the local authorities approx £1500 –£2000/week. 4:- The National fostering agency (one of many many agencies) founded a few years by social workers doubled its profits over the last 5 years in line with the increase in numbers of children taken into care and was sold to a company called Graphite for approx £130million ! (just google “nfa sale graphite ” to verify this on the internet). With figures like this around the children are just pawns in the moneygame, and woe betide any parent who seriously tries to “rock the boat” .All concerned in the childcare busines,from lawyers and experts,to carers and agencies, are on nice little earners so no conspiracy is necessary,but any mistakes are ruthlessly covered up rather than corrected,so that the conveyor belt taking children from their parents to go into care continues unaffected. This is beginning to look unpleasantly like claims referral for fosterers and we know how well that’s playing in accident claims, don’t we? The damning part is that they aren’t a foster agency. How do they justify their existences then? What value are they actually adding to the process? http//www.fosterfamilies.co.uk/latest.html what is this new jobs for the unemployed with mega bucks tax free at the tax payers expence. Thanks Natasha, Have you read the recent news that a foster carer is needed every 22 minuets of the day and night, that is adding up to well over 2.000 children a month, but no mention of grandparents to look after the children. Would be good to see some more common sense take hold. With my ongoing research into the bilions of pounds being made from the stolen children, I have discoverd a set up for ex social and care workers to become foster carers, under the name of (specialists foster carers) wow £750 a week with many other benifits, and should you not have a child to foster you will still be paid £350 a week, what a wonderful pension for social workers, as the saying goes keep it in the family. The children in the uk needs a top Q.C who at THEIR own expence and because he /she cares to bring out the truth of what the British Goverment are doing to children who are the silent witnesses. What is the support package like? We believe that the better we support you in your new career, the better you’re able to help a child to have a brighter future. •When you have a young person placed with you, you will be paid £750 a week, which includes an allowance for the child to cover their costs and your household expenses. •When you are in between placements, we will pay you a retainer of £350 per week for up to 12 weeks at any one time. “ST Christopher’s offering you a brighter future” place the above on line ! Are some of us in the wrong job? TWO OR THREE KIDS AT THESE RATES would certainly brighten the future for many readers !